Italian made Stone carving tools and stoneworking tools for the hand carving. Tools for carvers, sculptors, stone artists, and artisans. 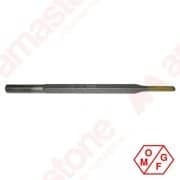 Applications: Stone carving tools are used by stone carvers, engravers and sculptors for producing stone reliefs, tombstones, sculptures, high-relief in Gravestones, memorial headstones. Here you find a wide range of hammers, mallets, and chisels to subtract material away from the blocks; and you find chisels at different angles to make letterforms, to lettering on monuments and make gravestones. With the right stone tools, sculptors are able to model a piece of stone (though many steps: percussion removal, rasping, sanding, and finishing), and create incredible artistic objects: statues, religious iconography, facades for cathedrals and abstract shapes. Pneumatic Hammer (or Air hammer) is a percussion tool used by sculptors. The advantage with the air hammer is that it is softer than hitting with a hand hammer but it hits so much more frequently. Pneumatic hammer for stones uses the same tools we have in the manual stone carving: flat chisels, teeth chisels, bush-hammer and so on. Chiesel for sculptors with a widia tip ideal to work stone and marble. Made in Italy by OMGF factory. This chiesel is available with different tip sizes, from 5mm up to 10 mm. Italian made steel hammer for the hand stone working. This video shows 2 chisels: one with a tip of 8 mm and the other with a tip of 18 mm. Bush-hammer tool to use in pneumatic hammers with fitting 10,2 mm. 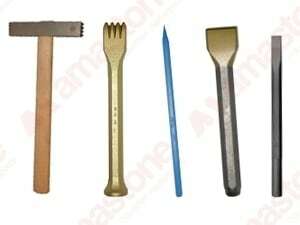 The shank of these tools is 10,2 x 36 mm. Tool made in Italy. Use only with plastic or wood hammers.